The new Salt Palace built on land that was once the "Little Tokyo" area of the city. 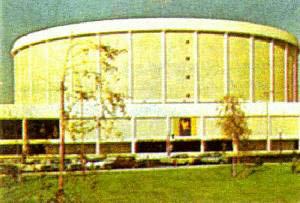 Originally completed in 1969 at the cost of $17 million, the 10,725 seat arena was the home of the Utah Stars of the American Basketball Association from 1970 to 1975 the Salt Lake Golden Eagles hockey club from 1969 to 1991 and the Utah Jazz from 1979 to 1991. In 1994, three years after the Jazz moved into the Delta Center, Salt Palace was demolished. A convention center of the same name stands on the site today.